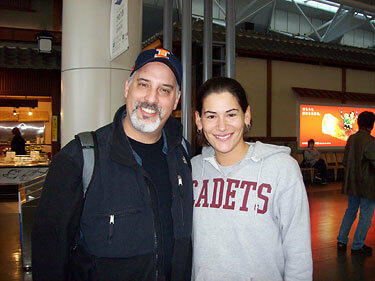 Paula Hyman, a member of the Cadets from 2002-2006, was in Japan during December and January as a member of the Aimachi Marching Band, a group based near Nagoya. She has been sharing her experiences in a series of DCI.org columns. In my last column we were preparing for the end of Aimachi's season while celebrating the Christmas holiday. After our fantastic Christmas party, we continued to rehearse and improve the quality of our performances. The strange thing about being with Aimachi is that there never really has been a set rehearsal schedule. You don't usually know what to expect which is very different from my drum corps experiences where every day was planned out for me on a dry erase board. Oh how I miss that luxury! Our schedule in Japan usually consisted of rehearsals from 8:30 p.m. to 11 p.m. during the week and then from about 10 a.m. to 10:30 p.m. on Sunday. That started to change as we made our way to the finals competition. At that point, I believe we went from noon to 11 p.m. a couple of days in a row before New Year's. This schedule started getting a little taxing after awhile, but the staff planned to give us New Year's Day off in addition to three more days on top of that, so we used that as incentive to keep going. My friend from the Cadets who also is here, Matt Haines, had his mom keep asking him if people in Japan celebrated New Year's. I still laugh when I think about it, because our New Year's Eve gathering pretty much just consisted of eating a lot of delicious food and waiting for the gong to be hit—the Japanese equivalent of the ball dropping in Times Square. We had lots of fun celebrating. This one where I have fries up my nose is from the New Year's Eve party. They dared me to do it, so of course I had to make them happy. The following evening we had a "New Year's Day" party. 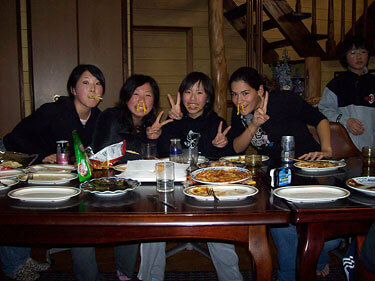 They cooked sukiyaki for us, which was very delicious. I was a little skeptical at first because you are supposed to dip the beef into raw egg, but I did it anyway. It turned out to be one of the greatest decisions of my life. After dinner we went bowling and then finished the night off with karaoke. Soon it was back to work. The last day of our New Year's break, more American instructors began to arrive to help us prepare for the end of the season. First to come was Gordon Henderson, who runs the marching band among other things at UCLA. Gordon has taught many drum corps, and he came in to help Aimachi with music as well as ensemble timing. He arranged our brass book, so it was helpful to have him around to make the necessary changes. We also had Marty Eby, who used to be a horn player with the Dallas Brass and actually marched as a member of the Santa Clara Vanguard. He does lots of studio gigs and movie scores out in LA. Marty is very passionate about what he does, so he was just a joy to be around and learn from. Bret Kuhn, former Cavaliers' percussion caption head, also came to work with us. He writes music for Aimachi's percussion section, and he is one of the nicest guys I've ever met. Mitch Rogers and me before he left for America. Last but certainly not least we had Mitch Rogers who is the Bluecoats' visual designer. Mitch writes the drill for Aimachi so he was around to clean up the drill as well as clean up our marching technique. It was fantastic having all those guys around. There was so much talent from many different groups all working together to make us great, and it was exciting to go to rehearsal and see how much better we were getting. Paula Hyman marched as a member of the Cadets from 2002-2006, in the mellophone section. She was section leader in 2004-2005, and horn sergeant in 2006. Hyman lives in South Florida where she teaches various marching bands and middle school brass sections. She will work with Teal Sound during the 2007 drum corps season.